In what is becoming typical of the moves by the World Muaythai Council (WMC) and their associate governing bodies, Liam Robinson has now apparently been banned along with an initial threat to ban Liam’s Gym Northampton gym of the United Kingdom. *This ban of the gym is now rescinded and includes only Liam himself. *The ban prevents Liam from participating on any UKMF sanctioned event for one year. As a fairly obvious joke Liam Robinson and some close friends have been sporting badges with the parody logo pictured above. Basically as an inside joke encompassing Liam Robinson’s friends (including Liam Harrisson)and gym mates they also sported shorts with the parody of the United Kingdom Muay Thai Federation’s (UKMF) logo that served as the punchline for Robinson’s ‘Team Scandal’. And from an outsider perspective well, it is funny. But apparently not everyone gets the humor in it. At the recent 8 man tournament hosted and promoted by Dan Green (Fight Sport Events Champions Trophy tournament) one of the fighters elected to publically impugn the joint integrities of both the UKMF and WMC by adorning his fight shorts with ‘altered’ logo’s of both organisations. The UKMF have announced an immediate expulsion of this fighter from all UKMF promotions for a period of one year from the date of offence. His Club is also expelled as are his fighters and students. promotions worldwide. Until the fighter has been made aware of the consequences of his illconcieved actions his identity will remain with held. In regards to the copyright lawsuit threat it would appear Robinson and his friends do in fact have a legal right to use the parody logo. See http://en.wikipedia.org/wiki/Fair_use#Fair_use_and_parody for details regarding this legal right. Normally, I wouldn’t even report something of this nature based on how small of an action it really was. But the sanctions UKMF have decided to take border on nearly ridiculous and pretty immediately offensive to my moral and ethical sense. Now the WMC is allegedly to be involved in the beginning of litigation towards a fighter, blacklisting his entire camp and one would have to guess all the people from the gym serving as officials for UKMF sanctioned events. *This ban of the gym is now rescinded and includes only Liam himself. 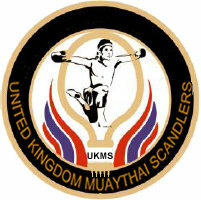 *I sincerely hope the Muay Thai community of the UK and the world recognizes the basic wrong in this dictatorial move. And early signs seem to indicate that they do. How ridiculous is it to have an allegedly independent sanction’s name emblazoned upon clothing anyway? How often do you see official Sears logo underwear or Microsoft branded beer coolers? Fighters never complain about being a walking billboard for UKMF or WMC yet both still occur. Has any of these independent sanctions given anything to all the fighters freely carrying their brand names around on their bodies while fighting in the ring? In that context walking around with a logo of any company is a fairly ridiculous and ironic exercise anyway. Whatever happened to fighters with shorts reflecting their own name or their gym’s name? There’s some element of hypocrisy here when the WMC and UKMF get free brand name advertisment without recognition or reward for the fighters yet sanctions are easily doled out with no regard to how trivial of a matter it is to begin with. Is the payment for being ad space for low moral independent sanctions the honor of fighting for the sanction? Fighters and gyms need to begin declaring their independence from this base brand name marketing of people who obviously don’t have the sport’s best interests especially its fighters as paramount concern. Stephan Fox himself has come to my site to decry how I was allegedly trying to discredit his organization. Let me counter by saying the WMC’s activities in the USA, Australia, the UK, Canada and other countries do far more to discredit WMC than I could ever hope to through my efforts. And the basic offenses are covered from simple incompetence to overt manipulation. 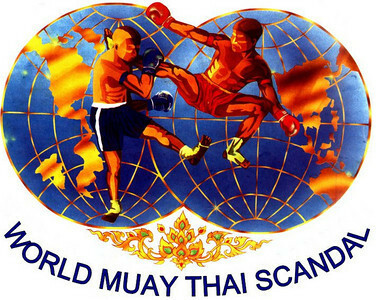 WMC is their own worst enemy and certainly not a friend to the men and women in the sport of Muay Thai. The events happen with no input from me. At most I comment on it and the activities of the WMC unfold wholly on their own. I’ve spoken on the WMC in the past for how they conduct their business, their record of black listing, lack of rankings and the recent Australia debacle with WMC illustrates their many issues even further. However even for the WMC and their associates this is a new low. The basis of this black list is now a joke logo which is clearly in every sense a parody. Yes, this hugely punitive blacklist against one of the rising stars in the UK comes from the basis of a 5 cm square of laminated plastic and a patch on shorts. The offensiveness of UKMF’s sanction is only slightly greater than it’s absurdity. Maybe the UKMF and their associates are thinking the logo carries weight based on how the WMC and themselves conduct their business. In any scenario is this how an independent sanction is expected to behave? Where is the balanced and unbiased perspective a true independent sanction is supposed to have? How thin is the skin of someone who elects to conduct business in the public eye for a sport that is viewed publicly in front of an audience of thousands on a regular basis? If this is any example of the UKMF’s model of maintaining integrity in the sport I score it as a massive failure. Now of course, some form of damage control for the UKMF and WMC is taking place in that they just plainly don’t talk in public any more. Though publicly announcing their ‘sentencing’ for Liam and his gym (that gym was threatened with ban at first) were apparently not an issue. In typical fashion WMC associates are operating in silence once it becomes obvious who the Muay Thai public of the UK supports and why they do. It’s honestly not a bad move for them since every time a figurehead for them speaks it results in disaster and a further plunge into their hole of incongruities. Eventually that hole is going to grow into the bigger hole of the inconsequential. And frankly they have never held up very well to public scrutiny. I warned everyone I could of what the WMC has in store for you if you elect to get in bed with them. It bears repeating though apparently: If you get in bed with the WMC keep in mind they like being on top. When what follows shocks or surprises anyone look at their track record and understand this is not new and not going away by their own efforts. This warning is applicable to anyone in Muay Thai at any level whether it’s as promoter, fighter, fan or gym owner. In the meantime I think I need to start making some new logos for my shorts, tracksuit and t-shirts. I feel some scandal coming on. ~ by fatsoking on September 17, 2010. OMG. How low can you go is all I can say?! I have a strange feeling we have not seen bottom yet. This story originated on AxKickboxing forum, however they have since removed it, saying that they couldn’t moderate the thread. I guess we know where their loyalties lie. Personally I think this whole situation is out of order and I certainly won’t be having anything to do with the UKMF whatsoever!!! and like to f@#$ you up the @$$!!! Forgot to say that they also like to f@#$ you up the @$$!!! This is only ONE of many issues that happen. Tired of it all. The thing of it that adds more irony is that UKMF is spearheaded by gym owners who havethreatedn ban on another gym. Conflict of interest here? Hello i recently attended the 8 man tournament show. It was my first time at a Thai boxing event. I was amazed by this fighting and skill so i decided to do some research and found this thread which i find laughable. I am a Solicitor which deals with copyright infringement. 1. You cannot sue anyone for wearing fake designer or copyright names or names of brands that are spelt wrong .This is not an offense if that’s was the case everyone coming from Thailand would be arrested!. 2. The manufacturer who made the goods is the only person you can sue for copyright infringement, they are the ones committing the crime, if the shorts were made in Thailand also it would be kicked out of court as Thailand does not recognize over 70 percent of copyright laws. 3. I do not know the full constitution behind the UKMF but if it is solely a democratic organization that is voted for its members you have a legal right by British Law to see who wrote the article, because it has been made public. 4. If the UKMF is paid for by its members for example licenses, insurance, shows etc you technically are the share holders and you can vote to expel or nominate a member on the board, for example the person who wrote the article. If its a sole business run by one member you cannot do anything. 5. In British Law if you have a constitution and enough members sign a petition against a member they can expel him, you only need 30 signatures to get him off the board or threaten his rank,if nobody votes for him in his favor ! its the same in politics simple fact of shareholders. It seems the UKMf is run by its members money therefore you pay their wages, my advice is you can make a petition and get as many people as possible to sign it .Say you will not pay your members fees, sanctioning fees etc if the board member who wrote this childish statement is not brought forward, you can vote him out by Law even if you still pay the fees as they are voted in and paid by YOU, the worst thing he could have done was make it public. 6. If the UKMF doesn’t do anything you then have a legal right by British Law to take UKMF to court because , you would be granted legal aid for this, because its been made public you now can even contact the Tabloid newspapers and you can even put it on exposing sites like ripoffreport and scam.com . 7. If you get expelled from the organistion or banned for not trading, for example earning money,even if its part time and you are a paid member, you can sue them free of charge in the Uk for restriction of trading, just contact trading standards , this is a free service paid by tax payers money so use it! That is why many sporting organizations fine the offending sport people and don’t expel them, if it was a sole owned business with no members paying the fees you could do nothing, but as its a member paid business you can ! 8. I find it amazing that somebody went to this extent to try and penalize a another member which was clearly a joke! Did he have a magnify glass to see this? 9. If you follow my words of advice above you can bring the above person out from the shadows. 10. One last thing is when dealing with an organization or business always try and get it out in the open, businesses, organizations etc hate this. The guy who wrote this done YOU a favor and certainly not himself ! 5. In British Law if you have a constitution and enough members sign a petition against a member they can expel him, you only need 30 signatures to get him off the board or threaten his rank,if nobody votes for him in his favour ! its the same in politics simple fact of shareholders. 7. If you get expelled from the organization or banned for not trading, for example earning money,even if its part time and you are a paid member, you can sue them free of charge in the Uk for restriction of trading, just contact trading standards , this is a free service paid by tax payers money so use it! That is why many sporting organizations fine the offending sport people and don’t expel them, if it was a sole owned business with no members paying the fees you could do nothing, but as its a member paid business you can ! 8. I find it amazing that somebody went to this extent to try and penalise a another member which was clearly a joke! Did he have a magnify glass to see this? 10. One last thing is when dealing with an organistaion or business always try and get it out in the open, businesses, ornaizations etc hate this. The guy who wrote this done YOU a favour and certainly not himself ! Hmm any more details on this? UKMF withdrew this ban, the poster of the original thread on ax resigned from UKMF, more recently another senior member also resigned. I am yet to receive an apology from the UKMF regarding the result of their actions and the impact on my gym and students. You certainly deserve that and in all likelihood some amount of re-compensation for lost income.